Do you miss 2012’s deluge of Meshuggah rip offs? Do you want to hear gurn inducing, mid-pushed heaviness, and don’t care about being even able to tell that it’s this band playing it rather than any other? If you clicked yes to any of these questions, Neorhythm’s Zetetic may be for you. Zetetic is a pounding, chugged, and fairly monotone album. The style of music these guys listen to and want to emulate is pretty clear – every song provides the same kind of angry, aggressive, anvil-esque sound, with variation coming from occasional panning of riffs around headphones, robotic vocals, or token (and underdeveloped) ambient passage. You can listen to the first 30 seconds of one song and you’ll know if this album is for you. It isn’t itself an issue that the album does one thing, if the album does it well. Zetetic does do it well – and it doesn’t, at the same time. 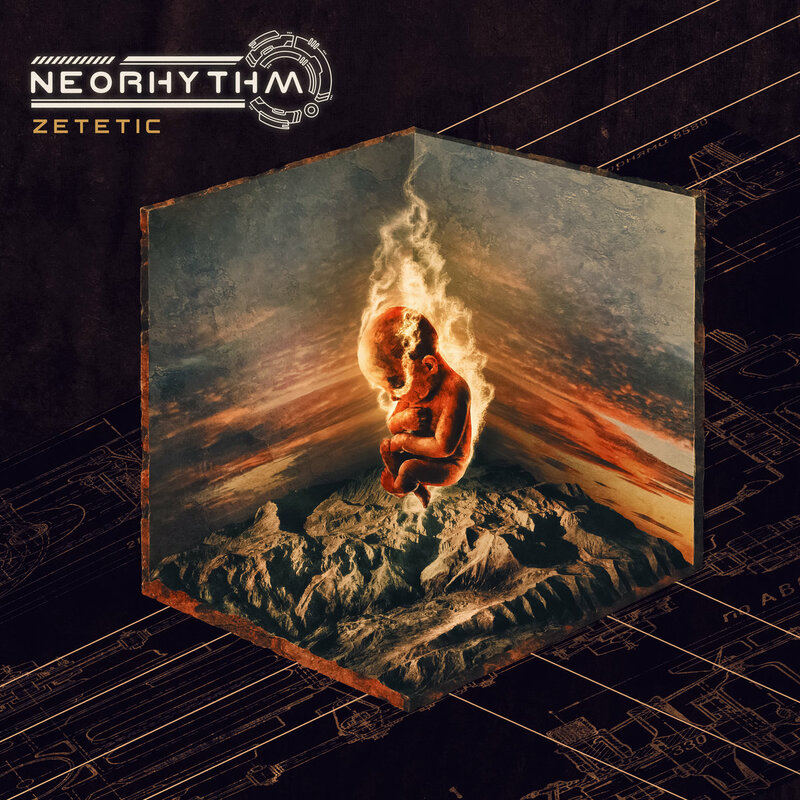 It’s one of the strangest listening experiences I’ve had for a while: Neorhythm seem to so unashamedly and confidently serve up generic modern metal/djent that you cannot help but resign yourself to enjoying it. The entire experience is, in effect, eye roll inducing. You’ll enjoy yourself, but be damned ashamed of it (Never before has an album managed to so accurately emulate the feeling I get after reading a bad joke in a Christmas cracker). Much of Zetetic seems like every other metal riff, processed to make it sound djent-y. The beginning of “Cosmic Genes” is especially like this, with its repeated chromatic riff panning around each earphone before moving into a more modern, chunky staccato section. So too for the next song, “Dark Matter”, in which the guitars, bass, and drums provide a galloping onslaught, embellished occasionally with fast bursts of tremolo picking or dissonant bends. Add to that some strong Vildjharta influences in the ambient clean sections – although the distorted parts aren’t quite dissonant or, frankly, interesting enough for this to take the place of the long awaited follow up to Masstaden – and some slam style riffs, and you’ve pretty much got all that Zetetic is. The niggling annoyance is that all this stuff is effective. You’ll listen to this album and bob your head and smile – it feels heavy and it feels like it should be deeply enjoyable – but you are aware throughout that it has a distinct feeling of fakeness and disingenuousness to it. Of course, being unoriginal isn’t new – get it – or even particularly lamentable. But unlike bands like Soen, who in their early career wore their influences openly but still manage to produce music that has its own value, Neorhythm have (in a very different style to Soen, mind) managed to take their influences and reduce them in complexity and interest, thus creating an album that seems bland, by numbers, and whilst annoyingly seductive for those who like this genre, ultimately unfulfilling. In fact, listening to Zetetic is actively uncomfortable for me – it feels like the band are constantly trying to dupe you, to tempt you into letting go of your inhibitions and enjoy their music for what it is. And, if you are able to let go of any sense of context, then maybe you will enjoy this album as a punishing piece of heavy metal. But for every song you listen to on Zetetic, there’s always the sense that you could be listening to the band that they are copying – and the songs from the band they are copying are probably better.